Customer Copy vs. Merchant Copy: Does It Matter Which Restaurant Check You Sign? Before I could stop him, my Dad got the server's attention. "Excuse me dude, sorry, I think I signed the wrong check," he told him. The server in question (at a Mexican restaurant so frequently visited by my parents that they didn't even need to be on a first name basis) looked confused at first, then relieved, then maybe even slightly annoyed. "Oh, it's OK, you can sign either one," he answered, before walking away, missing my Mom's I-told-you-so eye roll. For the record, I also told him so. You're presented with two slips of paper when you pay via card: one labeled "Merchant," and one labeled "Customer." I get it. It can be confusing. You want to follow the rules, right? You don't want the IRS or a mob lawyer or that aggressive hostess who yelled at you for leaning on the podium coming after you, right? You can't in good faith sign the customer copy, and expect to get away with it? Can you?! My parents aren't the only ones to fall victim to the Merchant/Customer check conundrum. I've been out to more than a few dinners where people scratch their tips and names onto the check labeled "customer," only to realize what they've done, mutter varying degrees of expletives, crumple the paper into frustrated origami, and sign the "merchant" check instead. I'm here to tell you, once and for all, it does not matter which one you sign. Everyone just needs to relax. Take a deep breath. And learn to stop worrying, and love having the option to sign either the merchant or customer check, whenever you so desire. How do I know it doesn't matter? Aside from signing a ton of restaurant bills -- and even more bar tabs (sorry mom) -- while never being judicious about which one I actually sign and never having any issues, I myself was a server for a few years during college. And this would come up. A lot. On my first day, I remember being actively panicked because I realized so many people had "accidentally" signed the customer copy, when I was putting together the day's checks to hand in to our manager. Naturally, she told me not to sweat it, and that it literally doesn't matter as long as there's a version of the check with their signature (or some type of primitive marking) on it, proving that they agree to amount they've been charged. If you've ever worked at a restaurant -- or likely, if you've ever paid for something at one -- you know this, too. And for many years, I never thought about this issue again. Till I the situation my parents, when I asked myself: "Wait, why do they even have two different types of checks, anyway?" If it truly doesn't matter, why confuse people? Like any 21st-century citizen worth their weight in fidget spinners and k-cups, I tried to Google the answer -- but to no avail. So I turned to the next best thing: a restaurant manager. Why are there two types of checks? Max Berlin has been a bartender for most of his adult life, and he's currently a manager at Papillon, a French Bistro in Midtown Manhattan. He's also a friend. So that's nice. And, he's willing to answer most pressing questions for me about the industry, even if they're kind of dumb. For the record, Berlin did confirm that there are subtle differences between the seemingly identical "Merchant" and "Customer" checks. 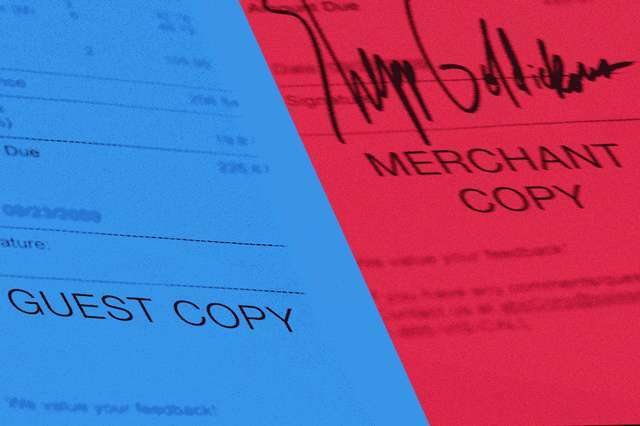 "The 'Merchant Copy' has an agreement just below the signature line that states the customer agrees to pay the amount shown on the receipt," he said. "The customer copy will not have this agreement, but it may have a friendly message, a 'thank you,' a tip percentage calculator... or all of the above. So the 'merchant copy' is basically designed to be a contract that is signed for the merchant records, and the 'customer copy' is used to for customer records." For bookkeeping purposes, on both ends, is it actually important to sign the correct version? "No. As long as there is proof that the patron has agreed to pay the amount, it's good. A simple scribble of a name below the total amount is all that is needed," he confirmed. "It's just about giving you the option, if you want it, and making it easier." Basically, restaurant billing systems give out two distinct versions of checks to people, as a courtesy. While it doesn't logistically matter if you sign the one labeled merchant or customer, point of sale systems are designed to give out two versions just to make the choice easier, and to allow slight levels of customization (like the friendly goodbye messages, and the shockingly handy tip calculators). If you want to take one home and keep it for your records, they make the choice simple. On the merchant copy, they make sure to put the verbiage this mini-contract needs (to cover their own bases), it's up to you to decide to sign that one, specifically. This system was a designed as an act of customer convenience. It's like labeling identical pairs of underwear for specific days of the week (what you don't do that?). It doesn't really matter, but it eliminates the terrifying possibility of choice. People are bad at making decisions, especially in public, especially after a few beers. Instead of just handing you two identical checks and letting you toil over which one to sign, the system has made "easier" for you by putting (basically, inconsequential) labels on them. Or at least… it's supposed to be easier for you. Bottom line: sign the customer check if you like. Sign the merchant check if you'd like. They are only doing this for you! But at the end of the day, it definitely does not matter.